Parents dealing with a fussy baby — especially one that has been recently fed, changed and loved — are eager to find ways to soothe them. Most babies up to six months old can only be awake for about one to two hours before becoming overtired. 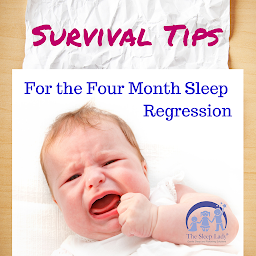 Part of the learning curve is being able to recognize a child’s typical sleepy cues, so that you can move them to a safe sleep space as soon as possible. These signs may include yawning, staring, fussiness, quieting down, losing interest in playtime, eye rubbing, and hand sucking. An alert or spirited child may move very quickly from happy to tired to overtired, so keeping one eye on the clock is also important. Be prepared to move straight to naptime or bedtime as soon as you see your child’s sleepy cues. When your baby is about three or four months old, you may start to see a glimmer of a schedule forming where sleeping and waking are concerned. This is because your baby’s internal clock — the circadian rhythm — is starting to develop. Look for this pattern, along with your baby’s sleep cues, and create a soothing naptime and bedtime routine, which can include white noise, feeding and rocking. Nap timing and length are often the last components of a baby’s schedule to develop, so you might need to use more effort and additional soothing techniques in the afternoon, when getting a little one to sleep can be particularly challenging. Motion is a favorite of babies for soothing because it likely reminds them of the sensations and security of their mother’s womb. Movement will often do what no other kind of soothing can do, so it’s a good technique to try. Rock your baby in your arms when you can, but if you need a break to get things done around the house or during times of extended fussiness, consider using a swing. Since every baby is unique, try a swing that has multiple motion options, such as the Graco® EveryWay Soother™ with Removable Rocker. With 16 soothing motions, six different speeds, two vibration settings and 15 songs and sounds, parents can create a personalized soothing environment to calm their little one. As an added benefit, the swing’s seat conveniently doubles as a removable rocker to keep baby happy and close by anywhere in the house. This swing is now exclusively available at Babies“R”Us®. Of course, it’s also important that parents take care of themselves as well. This is why Graco is giving moms and dads a chance to win a babymoon for a little rest and relaxation prior to baby’s arrival, in addition to a Graco® EveryWay Soother™ with Removable Rocker to soothe baby once they’re born. Enter the EveryWay Soother™ Anywhere Babymoon Giveaway by visiting http://www.gracobaby.com/en-US/everywaygiveaway. Babies cry when they’re uncomfortable, bored, overstimulated, and sleepy. There are a few things you can do to try and figure out why your baby is crying. Beyond the obvious diaper and mealtime reasons, try a change of scenery. You can also try dimming the lights, turning on white noise, placing your baby in a swing, or offering them a pacifier. Being prepared to tailor your soothing strategies to your child’s individual needs can help provide both you and your baby more relaxing days and nights.